A feast for the eyes - intricate carvings on the archways leading through the Sala de la Barca to the north portico are fine examples of Islamic art and architecture at La Alhambra, Granada, Spain. On their departure from Granada in Spain near the end of the 15th Century, the moorish rulers left behind a legacy of exquisite moorish architecture - housed within the walls of La Alhambra. 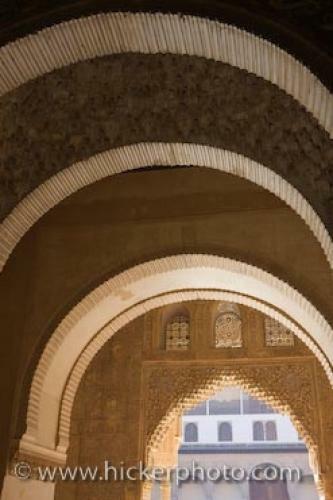 Walls and archways feature arabesques, and delicate latticed windows while the ceilings are decorated with stalactite-like formations with the addition of a vivid cobalt blue colored paint in some chambers. Looking out through rounded archways of the Salon of the Ambassadors (Salon de Embajadores) to the highly decorated archway and spandrels of the Hall of the Boat (Sala de la Barca), The Royal House (Casa Real), The Alhambra (La Alhambra) - designated a UNESCO World Heritage Site, City of Granada, Province of Granada, Andalusia (Andalucia), Spain, Europe. in the Sala de la Barca, La Alhambra, Granada.